What lies at the intersection of privacy protection and ubiquitous computing is easy to imagine: the frightning vision of an Orwellian nightmare-come-true, where countless "smart" devices with detailed sensing and far-reaching communication capabilities will observe every single moment of our lives, so unobtrusive and invisible that we won't even notice! With daunting Orwellian visions looming, it is easy to conclude that tamper-proof technical protection mechanisms such as strong anonymization and encryption are the only solutions to such privacy threats. Obviously, the less data is collected, the fewer privacy invasions can occure. However, perfect protection for personal information will hardly be achievable, and the interconnectedness of our daily tasks will render many of the envisaged security schemes largely impractical in our everyday routines. Instead, we propose to build systems that help others to respect our personal privacy, enable us to be aware of our own privacy, and to rely on social and legal norms to protect us from the few wrongdoers. 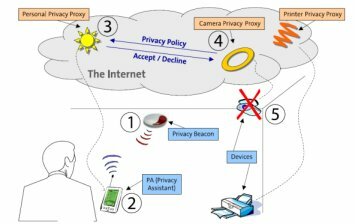 We are developing a privacy awareness system targeted at ubiquitous computing environments that allows data collectors to both announce and implement data usage policies, as well as provide data subjects with technical means to keep track of their personal information as it is stored, used, and possibly removed from the system. Even though such a system cannot guarantee our privacy, we believe that it can create a sense of accountability in a world of invisible services that we will be comfortable living in and interacting with. A Survey of RFID Privacy Approaches. An Update on Privacy in Ubiquitous Computing. Privacy, Trust and Policy-Making: Challenges and Responses. RFID und die Zukunft der Privatsphäre. Practical Minimalist Cryptography for RFID Privacy. Gibt es in einer total informatisierten Welt noch eine Privatsphäre? The Smart Tachograph – Individual Accounting of Traffic Costs and its Implications. Personalized Vehicle Insurance Rates – A Case for Client-Side Personalization in Ubiquitous Computing. Personal Privacy in Ubiquitous Computing – Tools and System Support. Die Privatsphäre im Ubiquitous Computing – Datenschutzaspekte der RFID-Technologie. A Privacy Awareness System for Ubiquitous Computing Environments. Privacy by Design – Principles of Privacy-Aware Ubiquitous Systems.